Stavros Studios is a family run group of apartments in a rural coastal location on the Island of Crete. It' s for those who enjoy the relaxing, traditional simplicity of Greece. 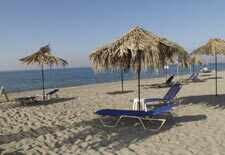 Stavros Studios and Apartments is situated right by thesea and with its own swimming pool. Situated in the heart of Agia-Marina in a quiet spot just 4 minutes walk away from the beach and from the main road.There are 3 large apartments with 2 bedrooms each,a large living room and a fully equipped kitchen. Although only five minutes' walk out of the old village of Gerani, the narrow ascent to Villa Selli is stony and shrouded in olive groves, taking you back a hundred years to the traditional agrarian economy of Crete. The villa commands a hill-top position nestling among olive groves with spectacular views from three sides over the bay and breathtaking views of the surrounding unspoilt countryside , populated in turn with olive groves and orange orchards. Amenities include a bar/cafeteria, swimming-pool, bank facilities, parking and an exciting entertaining program. You will find a friendly service, a relaxing atmosphere and lots to do and see here. The newly built hotel has 50 apartments and suites. Room service is at your disposal. The hotel is located 200 m away from the nearest beach, 23 km from the nearest airport, 9 km from the nearest hospital, 15 km from the nearest harbor and 9 km from thenearest town.